As Hurricane Michael blasted into the Florida Panhandle at 12:30 p.m. Wednesday, packing 153 mile-an-hour winds, airmen with the 53rd Weather Reconnaissance Squadron, were inside the belly of the beast. In fact, WC-130Js from the 53rd, based at Keesler Air Force Base, Mississippi, began flying missions into the eye of what would become a Category 4 hurricane on Sunday to gather valuable, time-sensitive information, , according to an Air Force press release. Over the past week, the C-130 crews, known as “Hurricane Hunters,” observed the storm intensify from a tropical depression to a major hurricane, with winds just 2 mph shy of a Category 5 storm, as it made landfall near Mexico Beach, Florida. The catastrophic storm's 150 miles-per-hour-plus winds delivered a direct hit to the base, bringing down trees and power lines, ripping roofs off buildings and causing significant structural damage. The Hurricane Hunters are charged with gathering data from inside storms in order to help the National Hurricane Center improve the accuracy of its forecasts of “the cone of uncertainty,” the probable track of the center of a tropical cyclone. The storm’s track was originally expected to hit the Florida Panhandle. It was named Michael over the weekend and was upgraded to a Category 1 hurricane by Monday. The Hurricane Hunters are the only U.S. Defense Department unit that flies reconnaissance missions into severe tropical weather during the hurricane season, which officially starts June 1, and runs through Nov. 30. 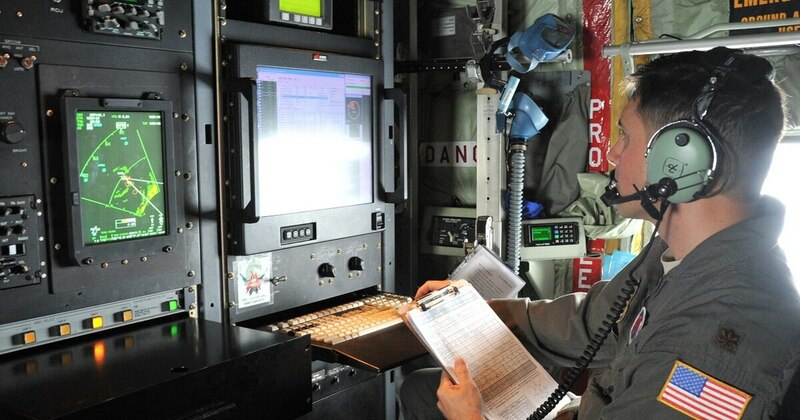 The data the airmen gather helps the National Hurricane Center to improve its storm warnings. The squadron flew a total of nine missions into Hurricane Michael to gather this information. While the model forecasts have improved for tracking storms, predicting their intensity is tricky. While inside the eye, the crew could see the storm surge hitting the coastline of Florida, according to Cross. Hurricane Michael wound up causing massive damage, and it may not be done yet.